SENSOR FEATURES The sensor housings are constructed of PEEK, a high performance thermoplastic that provides outstanding mechanical strength and chemical resistance. Multiple sealing materials are used to preserve sensor integrity over a wide range of applications. The 3-electrode amperometric sensor produces a current output that is proportional to the partial pressure of oxygen. The semi-permeable sensor membrane consists of a 50-micron thick layer of FEP (fluorinated ethylene propylene). The hydrophobic nature of this material provides a fouling-resistant surface area for the diffusion of oxygen into the reaction cell. The three-electrode reaction cell includes a gold cathode, silver anode, and a silver/silver bromide reference electrode. The reference electrode is used to stabilize the polarization potential, which ensures accurate concentration measurement. The entire reaction cell is housed in a replaceable PEEK cartridge, which makes sensor regeneration fast and simple. An integral preamplifier is encapsulated in the body of the sensor. This creates a low impedance signal output which ensures stable readings in harsh environments, and maximizes the distance between sensor and transmitter. A large stainless steel diagnostic electrode monitors the integrity of the cartridge membrane. Other sensor diagnostics monitor the condition of the cartridge electrolyte, loss of sensor seal integrity, and integral temperature sensor failure. TRANSMITTER FEATURES The microprocessor-based transmitter is loop-powered and fully isolated for high service reliability. The transmitter includes devices to protect the system from power surge and brownout events. The large, high contrast, super-twist display provides excellent readability over a wide operating temperature range, even in low light conditions. The main display line consists of large, segmented characters with measurement units. The secondary display line utilizes easily readable dot matrix characters for clear display of calibration and diagnostic messages. Two of four measured parameters may be displayed simultaneously. Four-button programming provides intuitive navigation through the menu-driven user interface. The 4-20 mA transmitter output can be configured to represent any portion of the measurement range. Output HOLD, ALARM and SIMULATION features provide the user with complete control of the system output under any condition. Diagnostic messages provide a clear description f system condition, which eliminates confusing error codes that must be looked up in the operator’s manual. 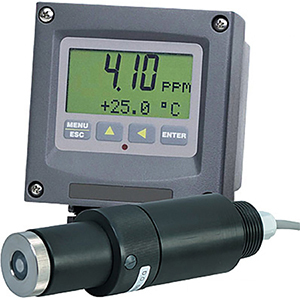 The flexible calibration method includes stability monitors that check temperature and main parameter stability before accepting data. Download the full specifications below. **DO electrolyte solution 4 oz. 참고: Comes complete with mounting bracket, 4 flat-head screws, and operator's manual. **When purchasing the DOE-45PA for the first time, it is necessary to also purchase the DOE-45PA electrolyte solution and DOE-45PA-RM sensor membranes.